Statues from the temple of Phanom Rung in Buri Ram province of Thailand have been defaced by vandals. 03 May 3007 (Bangkok Post) – Three sites in Thailand are given World Heritage Site status by UNESCO. Three ancient Khmer ruins and their surrounding areas and a historic park, all in the Northeast, have been declared World Heritage sites by the United Nations Educational, Scientific and Cultural Organisation (Unesco), officials at the Natural Resources and Environment Ministry’s National Park Department said. 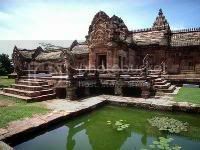 The sanctuaries of Phimai in Nakhon Ratchasima, as well as Phanom Rung and Muang Tam in Buri Ram were given World Heritage status. Surrounding historic areas were also annexed to the heritage sites. The other heritage site is Phu Phrabat historic park in Udon Thani. The Unesco World Heritage Centre has agreed to register both the sanctuaries, their surroundings and Phu Phrabat as World Heritage sites, officials said.